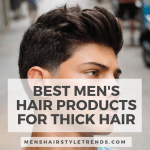 Longer hair for men has become mainstream and with it came the man bun. What is a man bun? Well, it’s a cool alternative to the ponytail for pulling long hair up and back. A bun it a twist or loop of hair. It can be worn high on the head, low towards the neck or somewhere in between. There isn’t just one man bun but a range of ways to style the look. 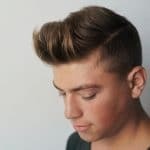 For something different, add an undercut, low fade or shaved sides. Keep reading for celebrity man buns, how to do a man bun and lots of different man bun styles. Norwegian Naval Lieutant and model Lasse Matberg looks the part of a modern day viking with long hair and full beard. He wears lots of different hairstyles but the man bun is one of his most popular looks. Of all the celebrity man buns, Jared Leto’s has garnered the most attention. He was worn the look to multiple awards ceremonies paired with a beard. This polished version is neat from the front, has volume in the bun and leaves some hair loose. Leonardo DiCaprio has embraced the man bun at every hair length. With just chin length locks, hair can be pulled back into a small bun. This works even better with an undercut. Here he has just enough length to fold over hair into a bun. Use product to slick hair back at the front for this formal look. Usually seen with a long ponytail on Game of Thrones, Jason Momoa often wears a man bun in real life. Another celebrity who has embraced this hipster style at every hair length, Jake Gyllenhaal rocks a low bun with a full beard. 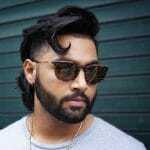 The man bun is a really versatile long men’s hairstyle that can be casual or formal and worn anywhere from the gym to a wedding. Of course, the styling varies along the way. This messy look seen Avan Jogia is ultra cool and works as well with his wavy hair as it does with straight locks. 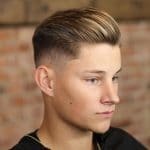 Adding an undercut or fade to long hair is a top trend this year. Adding a bun to the mix highlights this cool combination. Another popular combination is the man bun and beard. If you can grow all that hair, go for it. 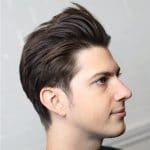 An undercut with long hair often shaves hair down low but can go up high as well. This cool style features an undercut with geometric hair design up to the ears and full hair pulled into a high bun up top. 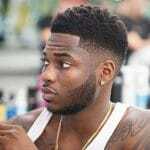 A fade tapers hair from short down to the skin. 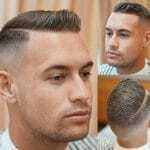 This low fade raises the hairline all the way around for clean cut edges when long hair is worn down and a unique look with a man bun. For really long hair, there are more ways to wear the man bun. This version is worn loose for maximum size, which works especially well balanced out by a healthy beard. There are two main ways to do a man bun. This is the more traditional and formal way. Gather hair into a ponytail with fingers, twist hair while coiling it around the base of the ponytail and secure with an elastic. Until this feels comfortable, you can also tie hair into a ponytail first before twisting the bun. This is by far the easiest way to wear the man bun. Start by forming a ponytail and securing hair with an elastic. When it comes the last pull twist of the elastic, pull hair part way through to form a man bun. That’s it. This works up high, in the middle and down low on the head. It will also work for shorter hair than the traditional bun method. The man bun doesn’t have to incorporate all hair. It also looks cool half up and half down. This messy surfer style uses the pull through method but with the loose ends pointing up instead of down. As a biker style, the man bun certainly doesn’t need to be neat and tidy. Loose strands add to the appeal. Here’s the same guy and hairstyle but with wavy hair. It’s tough to pick a favorite. Here’s another version of the undercut man bun style. Hair is shaved all the way around, creating a new hairline. The style is most dramatic from the side but is ultra clean cut from the front and back. This half up style is an easy way to keep long hair out of the face without pulling it all the way back. Long dreads can also be styled into a man bun. Try using a cloth headband or tying locs into a knot. Whether it’s wavy or curly hair, texture adds something to the man bun. The man bun can be worn up high, down low or in the middle of the head. This confidently casual look is placed just above the nape of the neck.